Let’s take a look at the next five aspects. For students, there are features you might want to consider that will help you study, such as highlighting, dictionary, note-taking, and text-to-speech. For example, you have the ability to highlight certain text that you want to go back to reference later. This is a great option for students. If you reference a dictionary often, you know how convenient it would be to have one built right into the ereader or tablet, rather than lugging around another book. You will want to pay closer attention to the storage capabilities, especially if the user is going to be doing a lot of game playing on it. Certain games use up more storage than others, but definitely more than eBooks, due to the graphics. Movies will also take up more space. However, some brands allow you the opportunity to expand the storage space via a Secure Digital (SD) memory card up to 32GB, such as Nook and Sony eReaders. Just as you would pay attention to the battery life on a laptop, you will also want to know what it is in your ereader or tablet. Unless you plan on being connected to a cord most of the time, battery life is important for times such as traveling, or in school. However, unlike the average laptop, the battery life for an ereader can be quite lengthy. For example, the Kindle Touch has a battery life of up to 2 months, based on average daily use of 30 minutes. In the case of the iPad, the battery life is about 10 hours with multi-media activities. To save money, some people look to share content. However, it’s not always an option. If you are interested in sharing content, make sure your ereader allows for content sharing from options such as Amazon’s lending library and Nook series. You will want to pay close attention to the rules regarding the length of time you can share content, or how often you can do it. Just as with all technology, prices will vary between the brands and features, but from year to year as well. You can now get a high quality ereader or tablet ranging between $100 to $200, including Kindle Touch, Kindle Fire, Nook Color, and Nook Tablet. Of course you can always splurge for an iPad, which will run about $500 for a model with 16GB and Wi-Fi. And, they can go up from there in price, depending on what options you choose. Also remember that you might have a monthly fee for 3 or 4G data network service from providers such as AT&T or Verizon. Good luck with whichever one you choose for your child! As Editor of http://ereaderguide.org, Lei Chidester enjoys sharing her insight and tips of the most affordable ereaders on the market. 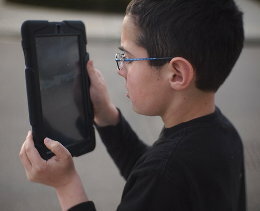 Buying an eReader for Your Kid [pt.2] was posted in Learning, Parents and Teachers by Guest Author.